Welcome to the newest set of Redesigning Super Mario Bros.! Today, we look at four heroes that serve as a second main party to the story we've been slowly exposed to. Where as to team one were made up of the all-time legends of Mario, Luigi, Toad, and Peach, team two is home to characters who I feel would make a nice rounded team of playable characters. These characters from afar look almost randomly tossed together, but as always, there's good reason why this rag-tag group look out for one another. 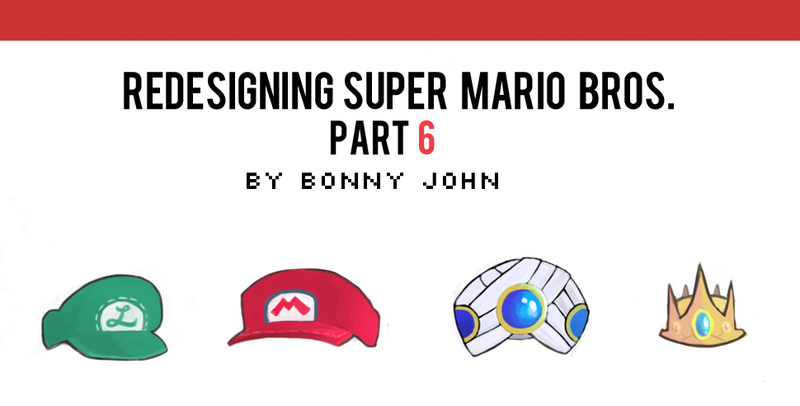 Let's find out what's going on with part 6 of Redesigning Super Mario Bros.! When Rosalina scanned the world below to find a hero with potential to thwart King Wart, even she was surprised to find that Bowser Jr. fit the mold even more so than Mario. Bowser Jr. is a powerhouse, and has access to his father's armory, giving him quite an advantage over the baddies that stand in his way. This rendition of Bowser Jr. finds the once puny offspring now an adolescent, standing nearly as tall as Donkey Kong! His character design is a mix and match between sharp and soft features. Bowser Jr. is not the same kid you remember - growing up, he quickly grew tired and bored of his father's antics. He could not share the same passion as his father's evil ways, and instead began to work against his dad behind the scenes, slowly producing bigger and bigger results as he grew older and more capable. Bowser Jr. can be looked as a bit of an anti-hero, but has quite of a soft spot inside his rough and rugged exterior. He would never admit it but he would totally fanboy at the sight of Mario and Luigi, heroes he has looked up to and always dreamed to have as mentors. Rosalina sent Geno, the ace up her sleeve, to help turn the tide against Wart to the young Koopa. Now normally, it would take months, maybe a good year to activate Geno by collecting stars across the land. Fortunately for Bowser Jr., his father had collected a good number of stars already, and activated Geno in zero time at all. Rosalina knew she selected the right hero for the job. Bowser Jr.'s design took a while to get down, and featured a lot of experimenting. I wanted him to appear larger than before, but in an awkward stage. To counterbalance his "baby" fat, I gave him rough features, like a scar going down his mouth, a bandaged arm, and using black/dark blue to keep him from looking young/cutesy with softer greens and yellows. I gave him a shoulder pad representing his heritage that also helps identify his regality...He is the Prince of the great King Koopa, and wearing armor of his father's army is almost ironic. Having given his old bandana/bib (he quickly grew out of it, literally) to his new apprentice Nabbit (made sense to make Nabbit the apprentice since they share the bib design as seen in their official renditions), Bowser Jr. adopted a new one for the sake of protecting himself from the poisonous goop that drips from his paintbrush when used. I gave him more hair than he had before, combining his old "Akuma" styled ponty tail with his dad's slicked hair. Combining the two gives him a youthful appearance. I changed up the style of the brush as well, turning it less "Play Skool" into something more industrialized. Now that Bowser Jr. is one of the good guys, E.Gadd has no problem upgrading the old brush that Bowsey had stolen, so long as he would do twice as much good for the people to make up for the havoc he's caused over the years. How I picture Bowser Jr. fighting as a playable character is that he has medium speed, but holding down the "run/dash" button would allow him to be the fastest character on screen so long as he was on a long stretch of land. This echoes his father's slow accelaration style in Mario Kart. While he's in top speed, Bowser Jr. can plow through enemies and small obstacles, like pipes and blocks. He's also capable of using his brush for melee attacks and can use paint and grafitti to slow down enemies before him, somewhat paralyzing them to a degree. He has poor jumping ability to offset his positive traits, but he's still easily the most OP character of the two sets of main characters. Nabbit was nothing short of ordinary, pulling off small heists from Toad Houses across the Mushroom Kingdom. Even still, he was not even decent at petty robbery. He was desperate and looking for attention, in need of some sort of recognition when in reality he was lonely and starving. Luckily for him. Bowser Jr. came across Nabbit in his travels and rather than punish him, instead decided to take him in as an apprentice. Because he was growing rather large at an exponential rate, Bowser Jr. passed on his bandana to the youngster, and began to use Nabbit to pull off even great stunts to put stops to many of his father's plans. Nabbit is a fairly new character, so many of you may not recognize him. Still, I really like his original design and found it hard to translate into my world. I more prefer the original, as it is simple and to the point, but for the sake of this project, I did my best to give him features and a look that made him unique and his own. Because he's always running around, I decided to give him clothes that would make him look sporty and athletic. This I think is a fun little juxtaposition in that he's rather fat and squatty to be considered athletic. Anyway, I made his rabbit feature's more apparent in subtle ways, such as giving him proper ears and shading in his face so it looks less tubular overall and appears to have a snout. I also had him add a nose to Bowser Jr.'s bandana so it would be more personalized to his character. Back to the story, Bowser Jr. knew exactly what Nabbit was going through, and took it upon himself to treat him like an older brother and show him the ropes. Nabbit is always clinging to Bowser Jr.'s words, and always jokes that they're the new "Mario and Luigi". Nabbit will follow any and all of Bowser Jr's order, without any second though. This is the first time Nabbit's had anything like a friend or family, so he will fight everything that would possibly tear the two apart. Nabbit's playstyle if this were a game would be that he would be the fastest character in the game, even faster than Toad in team one. Nabbit also has a long jump, a la Mario in Super Mario 64. Lastly, Nabbit can steal coins and items off of enemies he defeats. He may find random mushrooms off of Goombas stomped and pluck a few coins off of Koopa whose shell he had just stripped. With Princess Peach joining the fray in Mario's party under the protection of Toad, Toadsworth was left without a job. Known by many as a scholar, it surprises everyone moments after he reveals that he is also chief war advisor for the Toadstool family. In his younger days, Toadsworth was known as a brave knight who fought on behalf of King and Queen Toadstool, well before Peach was born, He was actually almost given the title and honor of "Toad", but beaten out by a friend of his who served on the battlefield. However, the Toadstool family saw how gracious and honorable he was, and given a new title: "Toadsworth" as he was worthy of the title Toad. Far along into the future, two titles are given to two heroes who will look after the royal family : Toad and Toadsworth. Our Toadsworth here is the first of many who will take on the mantle as such! How exciting to see where it began! As advisor to Princess Peach, Toadsworth on many occasions has acted as a stand in to royal affairs, and is well known and respected by royalty across the land, including Daisy, who he practically raised alongside Peach during their time growing up together for playdates and such. Toadsworth is a scholar who loves nothing more than to read with a cup of tea in the castle library, and even hosts debate club with members of royal kingdoms once every month, but also yearns for his glory days stomping baddies. When a distress call from Sarasaland came in directly from Princess Daisy, Toadsworth had to assess the situation personally. This could be his last chance to relive those glory days. On his way to Sarasaland, he lost the men he was marching with between Bowser's armies and soon by Wart's. What this confirmed to him was that Wart had been hiding in Sarasland all this time, planning his comeback. But what good was that information now that he was alone and helpless? He had no energy to spare and had no idea where he was. He decided to tuck himself into the forest he was lost in and fell into a slumber with no energy to keep him steady. A few days passed before a few figures walking through the forest woke him up. Large footsteps accompanied a scurry of step, amidst a bright light glowing from behind the trees he was hiding against. Nabbit, with his sense of smell, had picked up Toadsworth. Geno was lighting the way. Bowser Jr.'s golden eyes scanned the tiny creature before him. Toadsworth would not beg for mercy, he was a man who had seen worst of it. "Do what you will!" he shouted with what little energy he had. Nabbit walked closer to the old Toad, and dropped a mushroom at his feet. The three of them soon discussed what was going on, all finding they were on the same page and the same side. Toadsworth saw flickers of Bowser's face in Jr.'s eyes, but could tell his words saying he had changed were true. He had heard of the legendary Geno, who would aid a hero in the time of need by the people of the world below...and here he was, accompanying the dark prince and son of Bowser. Toadsworth was now in the company of three soldiers, whom he could help lead with his sense for strategy. Brains met brawn that day, and the four of them raced towards Daisy and Sarasaland. Toadsworth's design keeps the original coloring of his mushroom cap and is distributed to the rest of his outfit. This gives him a nice sepia-tone characteristic, which echoes with the old british adventurer style clothing he is wearing coupled with his age as seen by his stylized facial hair and puffy eye brows. This Toadsworth looks like he's seen better days, but is still not down for the count. Opposed to the old Toadsworth,who is definitely more regal and frail looking, their roles have changed and so has the attire. Updating his design to make him appear capable of being a player on this second team was critical, and now you may be wondering...What is his playstyle? Where Toad is the fastest of team one, Toadsworth is the slowest of team two, slightly behind Bowser Jr. However, Toadsworth has extraordinary defensive capabilities. One, he is given a free "dodge" per life played. For example, if you were about to be hit by a fireball spat out by a Pirahna plant, he would auto-dodge it. This is his instincts from his younger days a knight kicking in. Secondly, almost all enemies who come across Toadsworth would hesitate to attack an old man with a cane, giving Toadsworth an opportunity to jump on the enemy and attack or have time to run away. As princess of Sarasaland, Daisy is loved by her subjects. This is perhaps because Daisy has long abandoned the typical royal attitude towards life in general. She is seen as a firecracker, notably involving herself into the everyday affairs of the people. Against the wishes of her people, Daisy leaves the castle and brings her trusty croquet mallet to punish the minions of Wart who have recently begun to attack Sarasaland from the inside. As she's fighting, she is soon confronted by Bowser Jr., who breaks the serious attitude she's been wearing the whole time with a wild laugh. "You've finally come to kidnap me, huh? I've been waiting for this day!" Bowser Jr. explains that no, no one has any interest in kidnapping her. He is promptly hit on the head with her mallet. Daisy is glad to see Toadsworth, who she has known all her life. It's at this time that Toadsworth reveals that Wart had been hiding away in Sarasland this whole time, growing an army for who knows what purpose. Daisy responds by stating information received by her advisors that Wart's army has been marching out of Sarasaland, after finishing up their incubation period. This falls in-line to the message simultaneously cast out by Wart to all the royal kingdoms in the land -That with his dream machine complete, he would conquer the only threat in Bowser first before coming back to take over the rest of the world. Bowser Jr. then takes this time reintroduces himself as the hero selected by Rosalina and that he is an agent of good and has no idea about a feud between Bowser and Wart. He then introduces Geno and Nabbit who immediately falls in love with Daisy . Daisy suggests they all go to where the minions of Wart seem to be emerging from, a remote location in Sarasaland where they travel to over the course of two weeks. During that time, they fight and all learn to enjoy eachother's company. As a doll who's primary function is to battle, Geno is impressed with Bowser Jr's fighting capabilities. The same thoughts are formed in the mind of Bowser Jr. when it comes to Daisy, who recklessly charges into battle. She often clears the enemies before the others have a chance to do anything else. Bowser Jr. still jokes that she'll never be kidnapped, suggesting everything from dying her hair blonde to try and become more effeminate. Every joke leads with a mallet to the head. The gang is glad to have Toadsworth leading all other attacks that Daisy doesn't rush into, as his strategies has earned only victories for the group time and time again. Nabbit, who is most unrefined, has seen the most growth under Toadsworth. Where as to Bowser Jr. gives doses of tough love, Nabbit is showered by positive reinforcement by Toadsworth and cannot go to bed until is told a war story by the veteran. Daisy herself is having the time of her life, fighting alongside a group of competent warriors who she respects and admires. When the team finally reaches their destination, they find the remnants of Tatanga's alien ship...Brought down by Mario and Luigi some time ago during Sarasaland's time of need..and then it all made sense to the Princess. Of course! If Wart needed anything to fix his dream machine, it would be new age technology found in the wreckage of the alien air craft! With Wart nowhere in sight, and most of his minions cleared as a threat of Sarasaland, the team rushes to meet with Mario's party, who would soon get caught up in a fight between Bowser and Wart! My goal for Daisy's design was 1) to use the feedback and crits I got about Peach to deliver a strong and less creepy looking heroine and 2) elevate her past clone status. Yes, I know, she's got some differences but let's be honest, Daisy is not really interesting anyway. If I recall, when Daisy gets a speed boost in Mario Kart, she shouts "Hi, I'm Daisy!". What in the!? Does she really have to remind people who she is cause no one knows what this brunette is doing hanging out with the rest of the crew? For Daisy, I wanted to change up her body style and personality than what we're used to her. I pictured someone with tan skin- she's always outside and in the sun exploring and getting adventurous, opposed to Peach who stays indoor all day. She's shorter than Peach and younger too, and her overall design is to showcase her spunky personality. She cares not for the status of her clothes, her appearance is disheveled and quite frankly, she likes the look. She's got combat boots and elbow pads, ready to run through the mud and fight through the pain. Her dress is shorter and less poofy than Peach's. She has to give off her air of royalty as suggested by her advisors but she always want to have clothes comfortable to fight in...Either way, its gonna get tattered and dirty. Because Peach has a parasol to fight with, I wanted to give something to Daisy that would fit her royal nature and personality. I immediately thought of croquet, and the mallet was a perfect fit, since we've seen hammers are a big part of the Mario series. Overall, she was a lot of fun to work with, as was the whole of this set, actually. Because this was the second party, I gave them a lot of detail and attention,as much as the first team...And thus, the delay of the release of this set. Well that about wraps it up! Hope you enjoyed the art and the story, stay tuned for more soon! Enjoy your weekend!